It's been a while since I last updated, and now we're into the New Year and I'm (a little) more organised, I'll hopefully be updating more often. Please bear with me! Firstly, I hope that you all had a great Christmas and New Year, filled with lots of baked goodies! Previously, we've looked at baking, crumbcoating and sandwiching cakes. Now all that's left to do is to get your creation covered. Before covering the cake, you'll need to make sure the crumbcoat has set. If your buttercream is still wet, the icing will slide all over the place. Here is my crumbcoated cake. 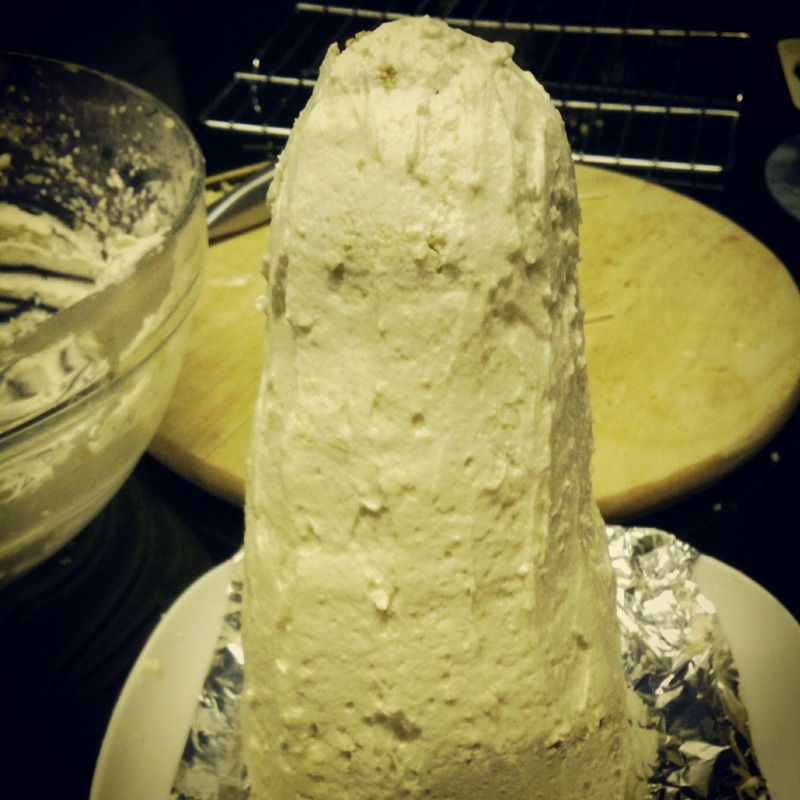 I was asked to make a Dalek for a friend, and while he is still naked, he looks a little rude! Next, you'll need to take your coloured icing, and knead it again until it's pliable. Some white vegetable fat on your hands will stop it from sticking. 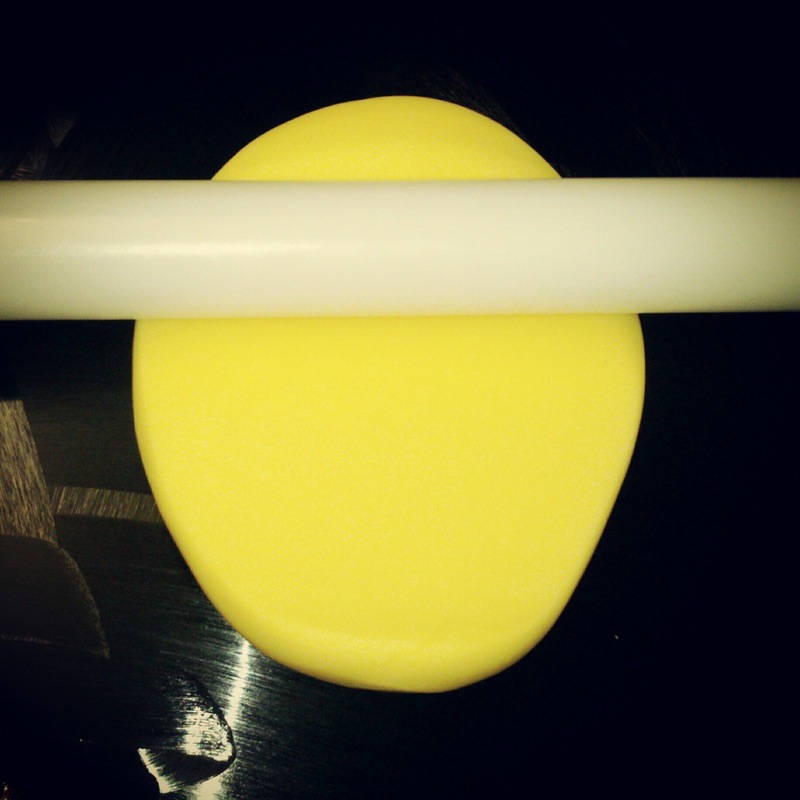 Smear some white fat on your board or worktop, and start to roll the icing out to the size required. I usually aim for the icing to be around 0.5cm thick. Once you've reached the desired size, drape the icing over the rolling pin, and gently transfer to your cake. I've no pictures of this I'm afraid - definitely a two-handed job! Gently smooth the icing on the top and sides of your cake, and trim away any excess from the bottom. If you have any air bubbles, gently prick them with a cocktail stick. Next, using an icing smoother (if you have one, otherwise keep going with your hands), gently smooth the surface and sides of the cake. A tiny amount of icing sugar on the smoother or your hands helps to give a better finish. 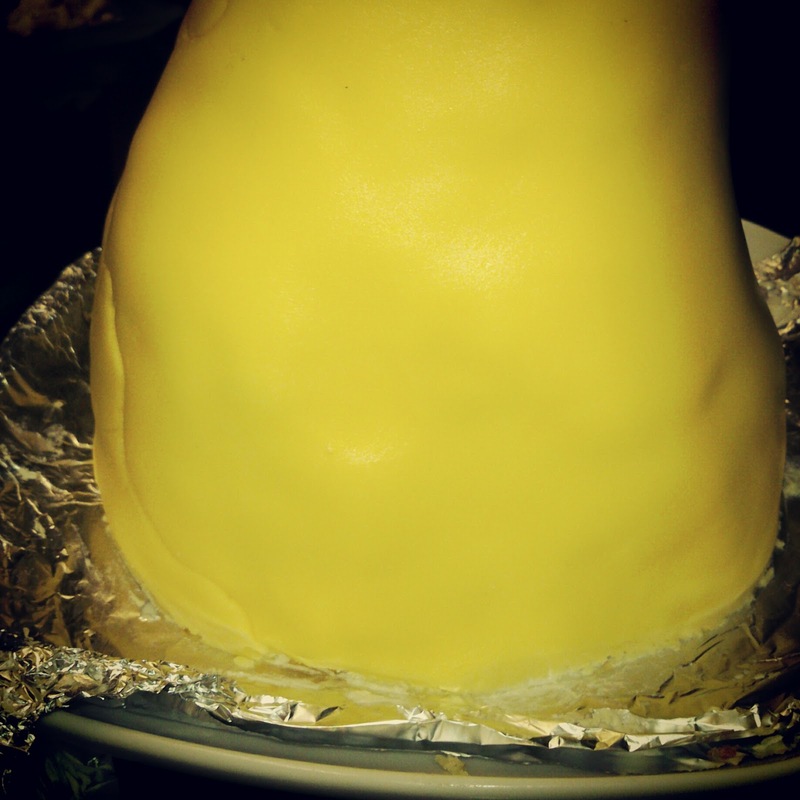 As I've made an odd shaped cake, I have a join of icing up the side. 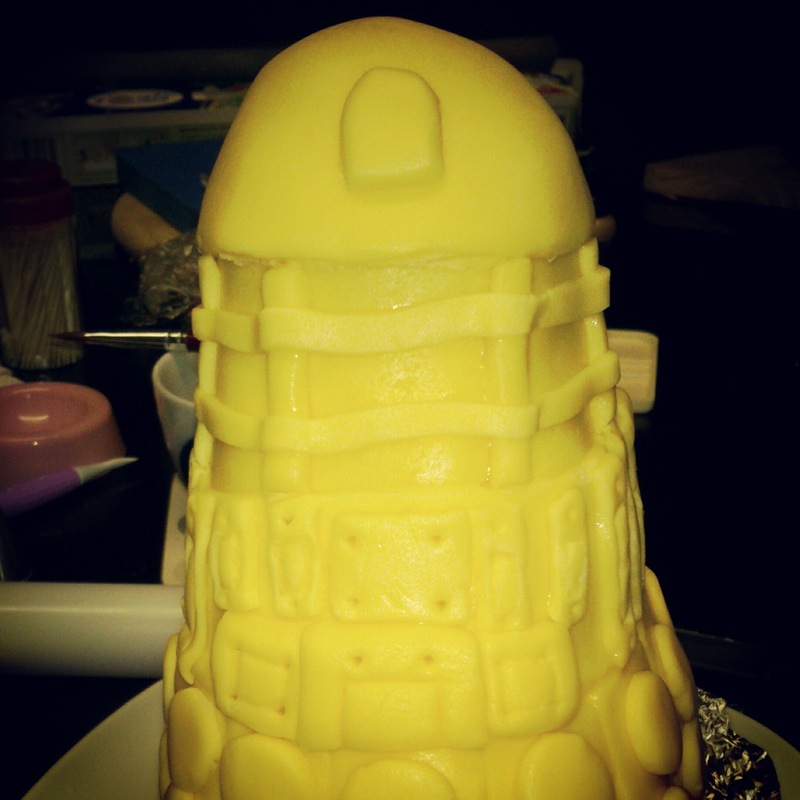 However, as he is to be decorated with his "armour" (not a Doctor Who fan so I don't know the correct term for this!) it's not too much of a problem. 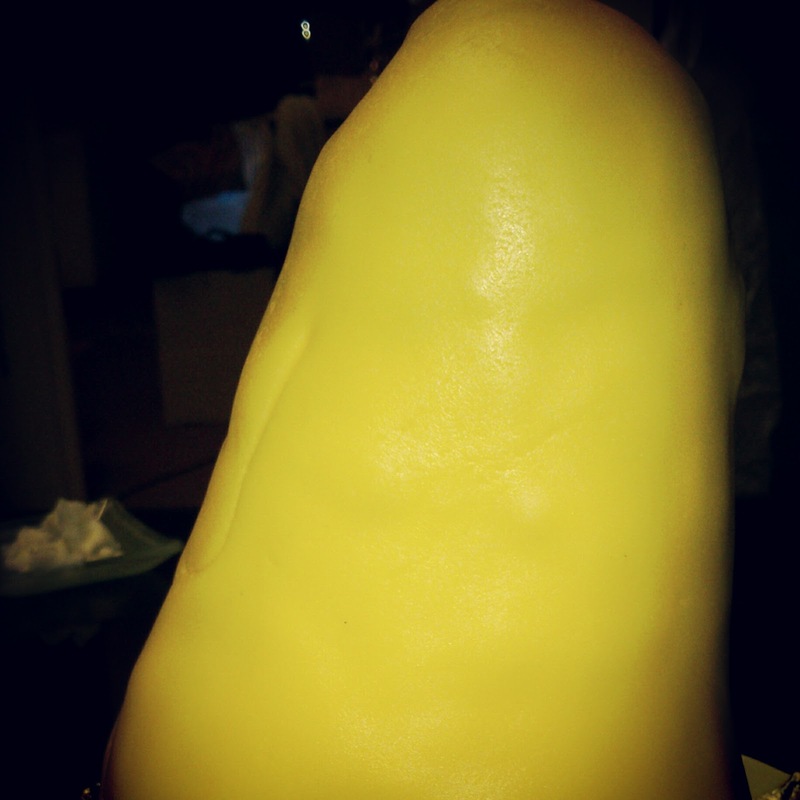 If you're covering a "normal" shaped cake, ideally you don't want to be seeing any joins in the icing. 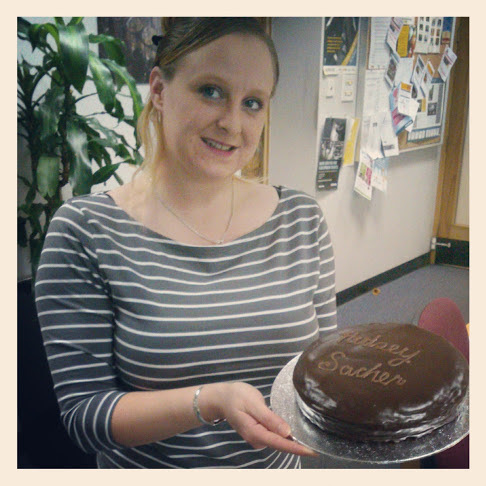 If there is one thing I've learnt while decorating cakes; it's do not panic if you make a mistake! 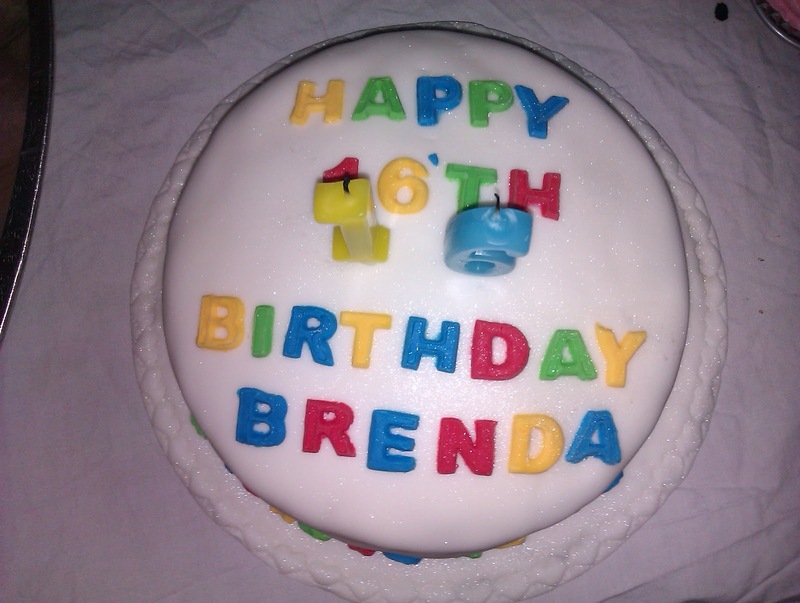 You can usually cover mistakes by adding decoration; whether it's letters, flowers, ribbon - the choice is yours! 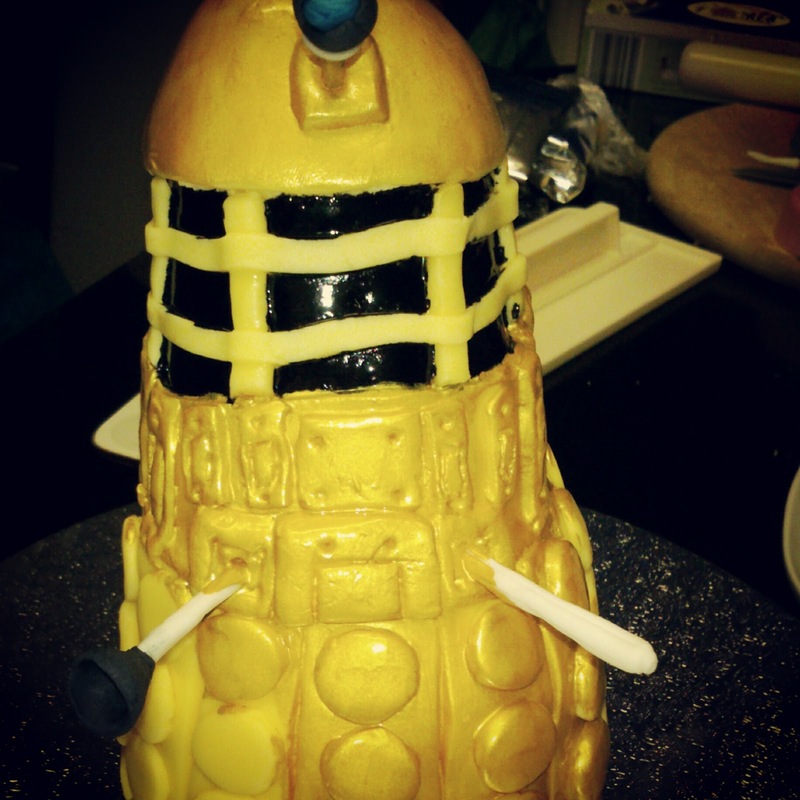 Here is my (slightly less rude) covered Dalek. Now you have your first covered cake. The next step is to add decoration. You can pipe messages, add flowers, stencil, paint, or add small flowerpaste figures - let your imagination run wild! 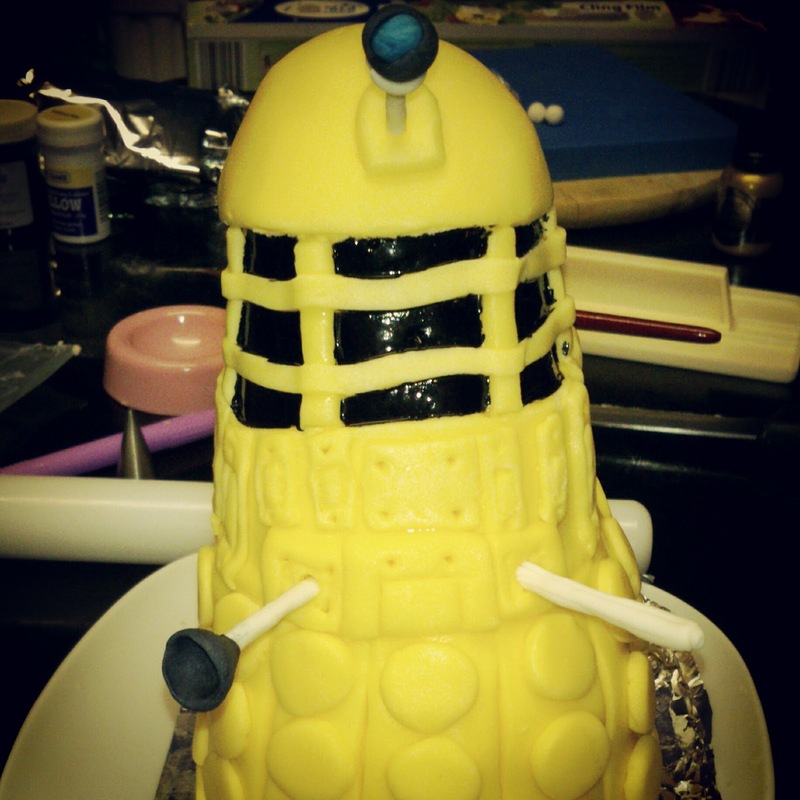 Once the Dalek was covered, I made his "armour" from coloured icing and stuck in place with edible glue. I then painted some parts black, and added flowerpaste decorations of his eye, gun and "plunger" which I had made the previous day. To make edible paint - mix a tiny amount of paste / gel colour with a drop or two of clear alcohol. I've got a miniature vodka especially for this. You can use gin or other clear alcohol, or food grade IPA (iso-propyl alcohol) if you have it. If you are planning on using flowerpaste decorations, these need to be made at least 24 hours in advance of use to make sure that they have dried properly. All armoured and ready to paint! Finally, I painted him gold and allowed to dry. And here he is - all finished! Please let me know how you get on covering your cakes. I'd also love you to share your baking pictures and stories with me! Next we'll look at covering cupcakes, and we'll also look at colouring buttercream too.